As more companies make Facebook advertising a larger part of their digital marketing strategy, they’re learning that campaigns can plateau after launch. The platform is constantly making updates and rolling out new features that can make a big impact in a short time. We’ve found two hacks that are especially effective for maintaining performance of our clients’ Facebook ads, and they’re both easy to setup and launch without additional ad budget. If any of your campaigns are stuck in a plateau, these hacks can help them break out and get better results. If someone takes the time to “like” your ad, share a post from your page or watch one of your product videos, chances are they’re more interested than users who just scroll past your content. Facebook allows you to target based on these interactions, and it’s a great way to increase your chances at converting a lead. 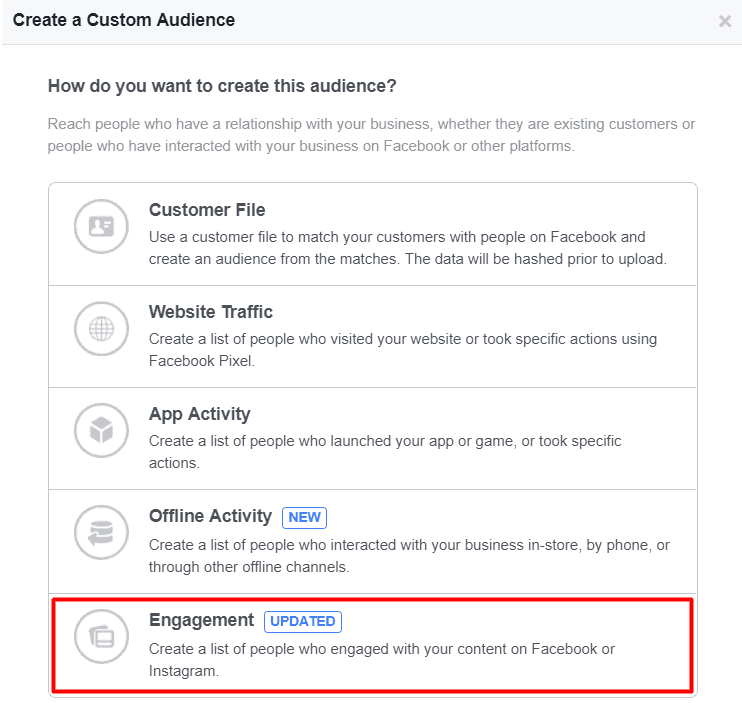 So-called “engagement custom audiences” can be extended to your Instagram profile as well, so you can target those users for extra impact. This tactic is also a great way to market to anyone who attended an event you created on Facebook, especially if you reference the event in your ad. This ad format is available in the Audience section of your Facebook Ads Manager. One of the most common challenges we hear from companies with a B2B product or service is that their ads have a very low lead conversion rate. They’re great for brand awareness, but the platform has historically fallen short when it comes to filling up the sales funnel with qualified new business opportunities. Enter the Facebook pixel. A Facebook pixel is a piece of code that can be easily added to your website, and allows you to “follow” a visitor to your site back to their Facebook profile and serve up an ad. The effectiveness of this hack has to do with the fact that you can customize the ad based on the website page the prospect visited. For instance, say your company offers three core services, each with its own web page. You can install the pixel on each page, and the next time someone visits one they’ll see content from it when they log into their Facebook profile. You can customize this ad for the specific service page they visited versus a generic ad for your company, increasing the chances they’ll click back to your website and fill out your contact form. These are just a couple of techniques that you can use to turbo charge your Facebook ad strategy. If you would like a customized recommendation for your campaigns, get in touch with us to schedule a consultation. How will Facebook Zero affect your business?